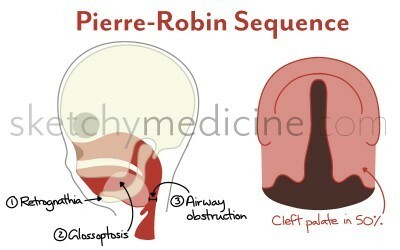 Pierre-Robin Sequence is not a syndrome, it’s a sequence. While it is a collection of features, one happens because of the one that came before. PRS, though not a syndrome itself, is associated with multiple syndromes including Stickler Syndrome, velocardiofacial syndrome, fetal alcohol syndrome and Treacher Collins Syndrome. Who knew that the ear could have so many parts to it? 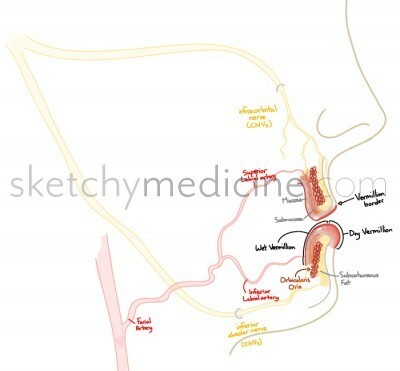 This is getting into some detailed anatomy, but you will be able to impress your staff person with your incredible knowledge. 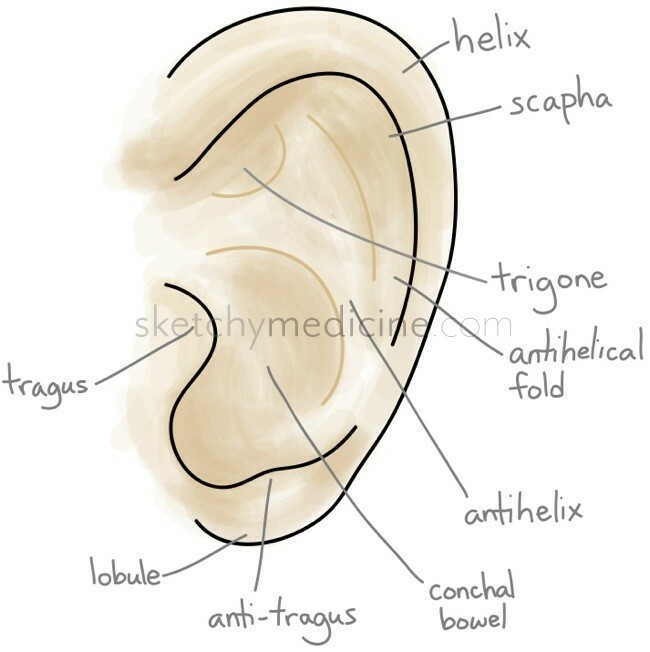 As a side note, you may also be able to impress your local piercer, as most of the more unusual ear piercings are simply named after the bit of ear the hole is going through. Lip lacerations are kind of a big deal when it comes to facial injuries. It’s because whether we admit it or not, they’re a very important part of the overall cosmetic appearance of the face. The tricky thing is the vermillion border, which is a fancy term for where the red of the lips meets the rest of the face. The lip is then further divided into the dry vermillion (the part that you put lip stick on, because it’s the part that you can see with the mouth closed) and the wet vermillion (the part that you don’t put lipstick on unless you want it on your teeth). 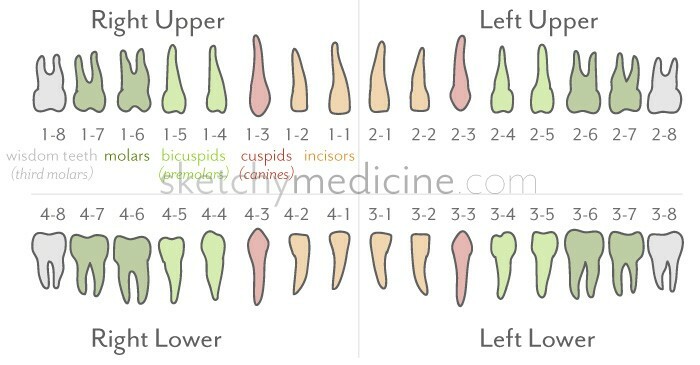 So when you’re repairing lips, you need to make sure that everything lines up juuuust right. The other important considerations are that unlike fingers, you can’t just pump the lips full of local anesthetic because it will distort the anatomy, this means that a nerve block is preferred. 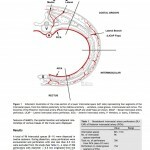 The upper lip receives innervation from the infraorbital nerve (a branch of CNV2) and the lower lip receives innervation from the inferior alveolar nerve (more specifically the mental nerve, which originate from CNV3). 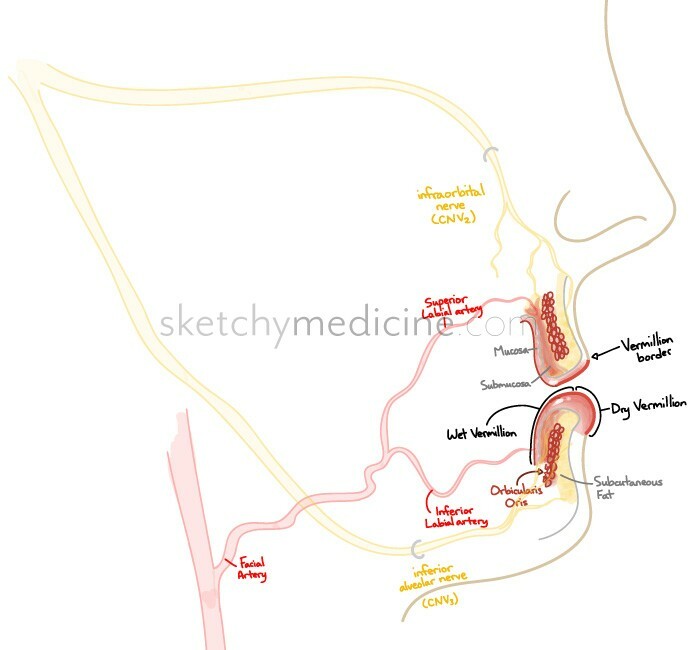 Blood supply comes from the superior and inferior labial arteries (guess which one goes to which lip), which are branches off the facial artery.